Alicia earned a BM in violin performance from the Cleveland Institute of Music and a MM from the University of Akron. She was a free lance musician for many years in Cleveland, paying her way through college as a strolling violinist at a five star restaurant. Alicia performed with the Akron Symphony Orchestra, Erie Philharmonic, and the Cleveland Chamber Symphony. 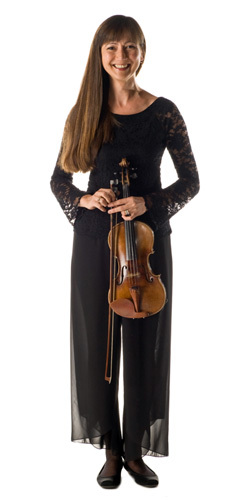 She returned to Tucson near the end of 1999 and has been a violinist with the Tucson Symphony since 2000. Alicia also performs with the Tucson Pops, Tucson Chamber Artists, and the Aricelli String Quartet. Although performing is her first love, Alicia believes in the importance of music education and is an active music educator. She teaches violin and viola; is an OMA kindergarten teaching artist for TUSD; a music and movement teacher for St. Mark’s Preschool and Kindergarten; and is the director of Coyote Music Together, which offers an early childhood music program for babies, toddlers, and kindergarteners. When not involved with music, Alicia likes to spend time with her husband Scott, their daughter Sydney, and her cat and dog.